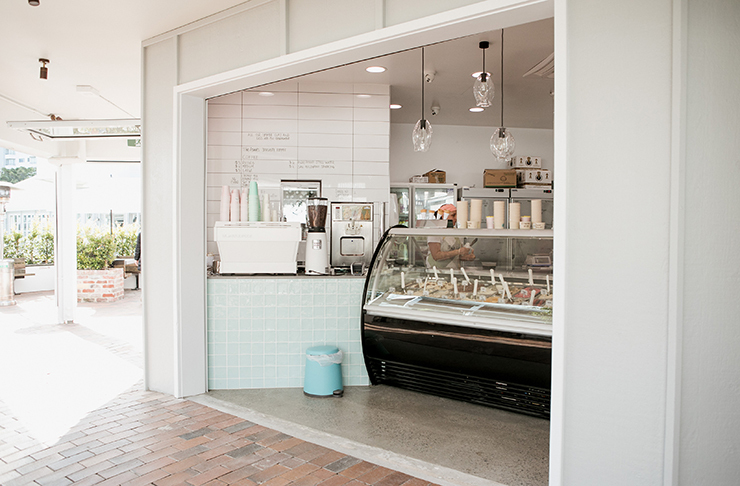 Forget about how cold the weather is, Fior Di Latte Gelateria is finally here! Think sorbet-coloured walls, bowls of ripe lemons on display, the smell of homebaked ginger nut cookies, and row after row of creamy, frosty, intensely-flavoured gelato, just begging to be tasted. 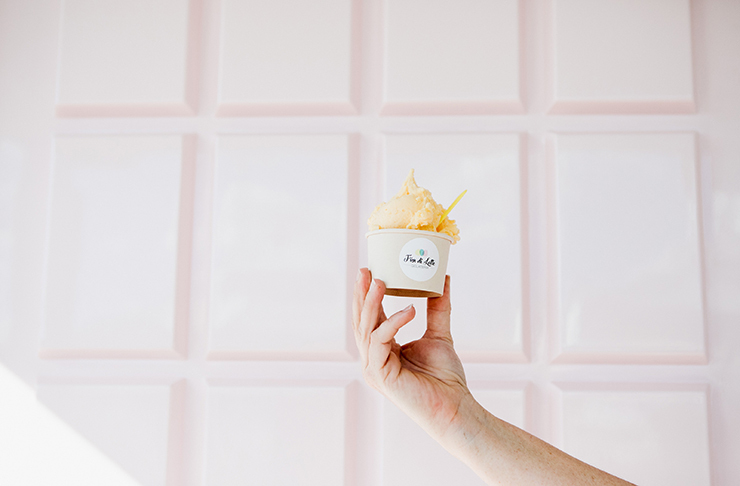 Fior Di Latte is the brainchild of Kim and Craig Galea, who have been bringing us all sorts of magical creations for years at Pitchfork in Peregian. We are pretty passionate about Kim’s desserts and pastries, and couldn't be happier that she's finally turned her hand to the art of gelato. We’ve gotta be honest, she’s taken it pretty seriously. Kim went to Melbourne to study at the Carpigiani Gelato Institute (yes, our first question was also “why has no one told us this place existed before now? !”) so she’s all over the latest techniques of churning and infusing flavours to give us that intense depth and creamy texture that you only get with gelato. If you’re lucky enough to sneak a glimpse through the chocolate bar door (Craig’s dad is a cabinet maker and he custom designed their door to be an actual Willy Wonka-esque giant chocolate bar) then you’ll see some serious Roald Dahl-style magic happening. House-brewed espresso syrup reducing, to be drizzled over sponge fingers and layered with creamy mascarpone for the tiramisu gelato, rhubarb poaching for the dairy free, vegan strawberry and rhubarb gelato combo, and Coco Pops (we kid you not) being sprinkled over the best chocolate milkshake—only frozen—you’ll ever taste. And we’ve even heard a rumour that they’re churning up an epic Queensland flavour—Bundy rum and raisin. Oh. Em. Gee. 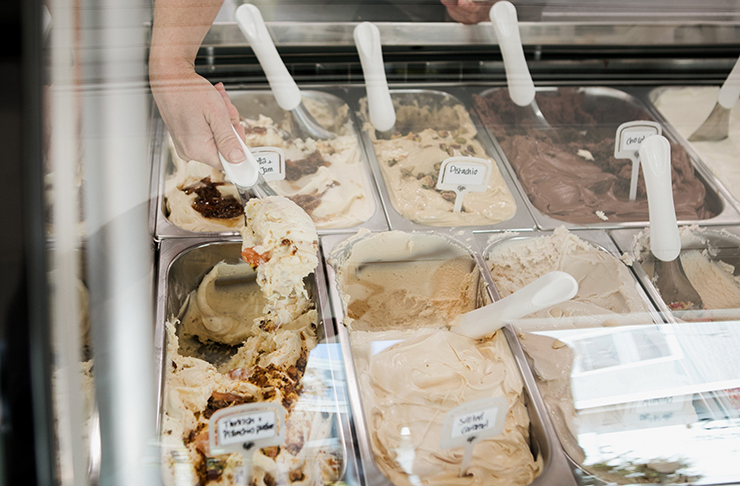 Kim and Craig are so committed to maintaining quality at every step of the process, you’ll even see fresh Eumundi milk being pasteurised in-house to make the ‘fior di latte’ milk base for all their dairy gelato. If you’re into sustainability, this place will make your heart light up with green, eco-friendly joy. Wherever possible, the ingredients are sourced locally and seasonally, reducing the food miles, and making the most of the amazing produce of the Sunshine Coast. So grab a biodegradable bamboo cup and sugar cane spoon, order a big scoop of super-grownup Campari and orange gelato *drool*, and kick back on the custom-made melting gelato bench seat as you live it up, baby. If you love a new opening how about checking out our best new openings on the Sunshine Coast in 2018 (so far).